Bernard Meyers certainly sees the same things we do, but plays with the contextual cues, so that we are unsure of what is making the world look the way it does in his photographs. Over the last three years he has persisted in pushing the edges of the architectural envelope. First, to show us only barely recognizable architectural elements, to a point, now, where only a slight whiff of rational geometry remains. Surfaces collide like scenes from Blade Runner, where those surfaces are not what they seem. We feel like we are experiencing a kind of vertigo that keeps making us have to reset our visual mechanism, looking for a more rational world, but never quite getting there…not with any certainty. But the effect is thrilling, consciousness raising, and certainly rewards our extra efforts, necessary to get there. …. instead of scenes that appear in our minds as if immediately present, the sensuous textures, rhythmic patterns, and copious details in Bernard Meyers’ prints, while they let us feel their visual music, challenge our minds to penetrate the represented spaces and suss out the arrangement of the parts. Along the way, we discover new meanings and significance in what we see. 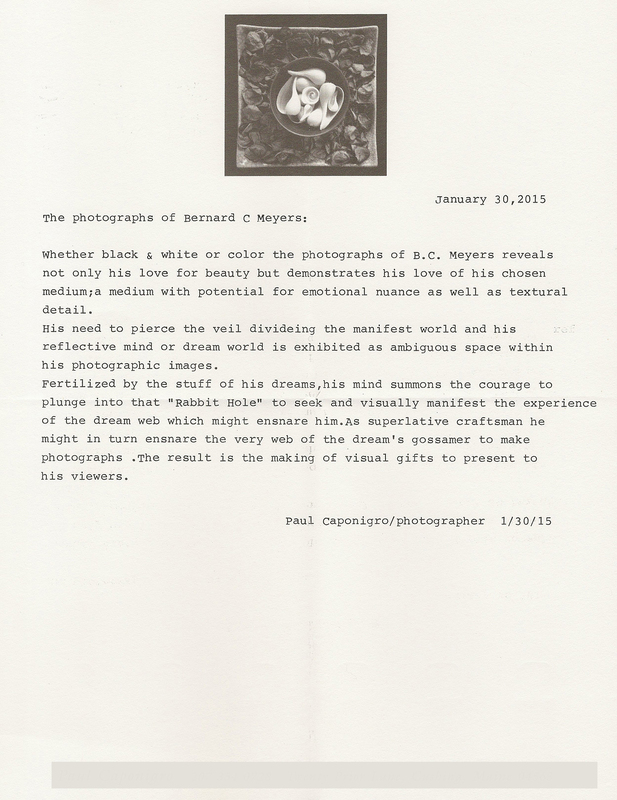 As with life itself, the more information revealed in Meyers’ photos, the less unified and simple the world appears, and the more aware we become of the limits of mere perception to take us behind the veil of material reality.